Number of Pieces: 2 pc. Tool Type: Impact Driver and Drill Driver. Battery Type: Nickel Cadmium. Voltage: 18 volts. RPM Range: 0-2400 rpm. CSA Listed. Color: Yellow. Case Included. Chuck Size: 1/2 in. Charger Included. Batteries Included. Wattage: 380 watts. Battery Charge Time: 60 min. Cordless. 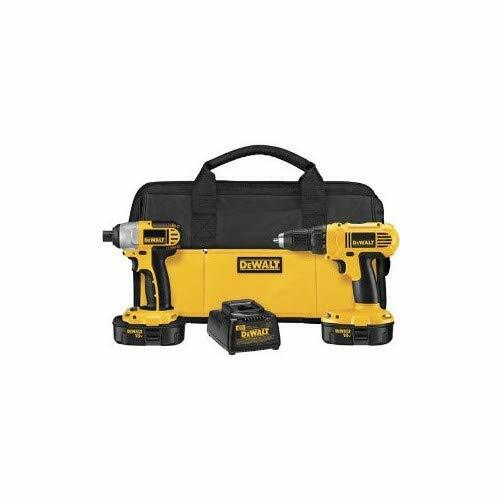 1/2" Compact Drill/Driver delivers 380 watts out of max power, 0-450/0-1,500 RPM. 1/4" Impact Driver with 1,330 in./lbs. of torque and 0-2,400 rpm, 0-3,000 imp. 90 day money back guarantee, 1 year free service contract, 3 year limited warranty. Includes: (2) 18V NiCd battery packs, (1) 1-hour battery charger, and case/bag (may vary). . .